Starting tread with a single rounded edge along the left or right side. This starting tread will have one semi-circular curve along the left or right side and may be installed below a "bird cage" or the handrail volute. This starting step is available unfinished or prefinished with a beautiful clear top-coat (natural). Starting steps as their name implies, is the first stair at the bottom of a staircase. This step starts your ascend upstairs and there is typically only one per staircase (unless you have multiple runs). A single turnout starter step is curved on one side (also called a volute) and is square on the walled end. Left and right are relative as you face the step. Note: Starter treads and starter risers are sold separately. Order a standard starter riser with this tread - the shapes of tread and riser will match each other and will allow a 1-1/4" overhang on the appropriate sides. 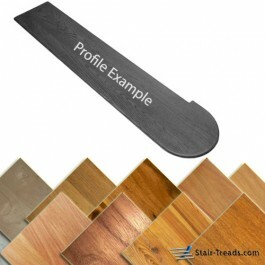 See Matching Starting Step Risers. 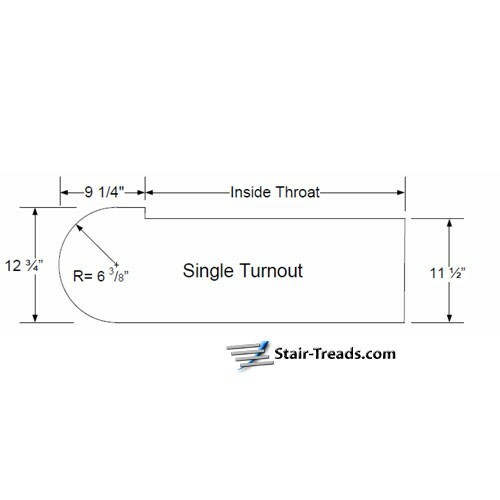 Our standard left or right turnout starter steps have a single rounded edge along the left or right sides that make a 1/2 circle turn on one side - also called a volute or turnout. This starting tread will have one gentle curve along the left or right sides and is thus called a "single quarter turn" tread. The measurement of the notch or cutout on this type of tread is called the "Throat Length".